Background: Lectin-like oxidized low-density lipoprotein receptor-1 (LOX-1) is one of the pattern recognition receptors that plays a critical role in vascular diseases and host immune response, LOX-1 can induce endothelial dysfunction through pathways implicated with oxidative stress and inflammation that ends with vascular lesions. Objective: The objective of the study is to evaluate the serum level of soluble LOX-1 (sLOX-1) in preeclampsia (PE) and normal pregnancy to study its relationship with the severity of PE and birth weight. Materials and Methods: A total of 56 patients with PE were allocated to the study together with 28 healthy pregnant women as normal controls. PE patients divided into 28 mild and 28 severe PE. Levels of serum sLOX-1 were measured by sandwich enzyme-linked immunosorbent assay technique. Results: Results showed a significant increase in the serum sLOX-1 in preeclamptic patients (P < 0.01) compared to normal controls. The significance increased in serum levels of sLOX-1, was noted in mild (P = 0.001) and severe patients (P = 0.001), compared to normal controls. There was a significant decrease in fetal birth weight in severe PE as compared to mild and control groups which was correlated with sLOX-1, furthermore, logistic regression of the variables for the presence of low birth weight <2.5 kg. Conclusion: High level of serum sLOX-1 is associated with the occurrence and severity of PE, which provides additional information for predicting of PE and preventing its complications and for better understanding pathogenesis of PE and the results highlight the involvement of innate immunity molecules and inflammation in pathogenesis of PE through binding to apoptotic cells and angiogenic process. LOX-1 also expressed on monocyte and macrophage, vascular smooth muscle cells and platelets. LOX-1 proteolytically cleaved at its membrane-proximal extracellular domain and released as soluble forms (soluble LOX-1 [sLOX-1]), which appears in the serum and can be measured., In vivo measurement of soluble LOX-1 may provide a novel diagnostic tool for the evaluation of disease activity affecting the vascular endothelial system which is a well-known consequence of PE. In addition, it has been reported that LOX-1 expression can be increased in cultured endothelial cells by shear stress, homocysteine human cytomegalovirus interferon-g. Under normal conditions, the LOX-1 expression in vivo is low but can be induced by several pathological conditions, including hypertension, angiotensin II, Ischemia-reperfusion injury, transplantation, C-reactive protein, and endothelin-1. Since most of these pathological conditions and others are seen in PE and LOX-1 expression in PE is unclear we aimed to measure serum sLOX-1 for its possible direct or indirect role and its association with the development and pathogenesis of PE. Low birth weight is closely associated with high rates of neonatal morbidity and mortality as well as chronic disease in the adulthood, and intrauterine growth restriction is an important cause of neonatal low birth weight. According to PE pathophysiology, shallow trophoblastic invasion of decidual arteries, and reduction in placental perfusion, infants born to mothers with early PE have been shown to have reduced birth weight compared to infants born to normotensive women at similar gestational age. In this cross-sectional case–control study, a total of 84 pregnant patients, who were admitted to obstetrics and gynecology department with hypertension and edema after 20 weeks of gestational period, hospitalized and eventually delivered nulliparous with a diagnosis of PE, between October 2017 and May 2018, were included. Moreover, 28 pregnant women, who had no known hypertension, and an uncomplicated pregnancy, presented to the obstetrics and gynecology outpatient clinic for routine prenatal screening, were recruited as the control group. The diagnosis of PE was based on the American College of Obstetricians and Gynecologists guideline as follows: a systolic blood pressure of ≥140 mmHg or diastolic blood pressure ≥90 mmHg, measured twice in 4-h intervals while resting, after the 20th gestational week, as well as 300 mg proteinuria detected in a 24-h urine sample, or in the absence of proteinuria, hypertension together with evidence of systemic disease, including thrombocytopenia, increased levels of liver transaminases, renal failure, pulmonary edema, and visual or cerebral disturbances. Moreover, severe PE was defined as the presence of any of the following criteria: Systolic blood pressure ≥160 mmHg or diastolic blood pressure ≥110 mmHg on two separate measurements, performed at 6-h intervals at the least, elevated serum creatinine level (>1.1 mg/dL), headache, visual impairment, epigastric pain or pain in the right upper quadrant, elevated hepatic transaminases (≥40 IU/ml), or pulmonary edema. The study participants were divided into two groups as PE and controls. In addition, preeclamptic pregnant was subdivided into two categories such as severe (n = 28) and mild (n = 28) PE. The exclusion criteria of the present study were as follows: The patients who had a history of structural heart disease, heart failure, coronary artery disease, chronic hypertension, type 1 or 2 diabetes, gestational diabetes, multiple gestation, active labor, polyhydramnios, premature rupture of membrane, severe liver or kidney failure, obesity (body mass index [BMI] ≥30), malignancy, hypo-hyperthyroidism, hematological disease, acute or chronic infectious or systemic inflammatory conditions, and autoimmune disease. Demographic, clinical, and laboratory characteristics of patient and control groups including maternal age, gestational week at delivery, smoking habits, and medical treatments on admission were recorded by systematic review of patient files. Height and weight were recorded, and BMI was calculated as the weight divided by the square of height (kg/m2). Eligible patients were above 18-year-old at the childbearing age, and all were able to provide written informed consent. The trial protocol was approved by the Local Ethics Committee. Blood samples were taken after a 12-h overnight fast from the antecubital vein with the patient in a sitting position, into free anticoagulant tubes. The serum was obtained by centrifugation at 3,000 rpm at 4°C for 15 min. Obtained sera were stored at −20°C until analysis. All routine biochemical and hematological parameters were measured on the day of blood draw. 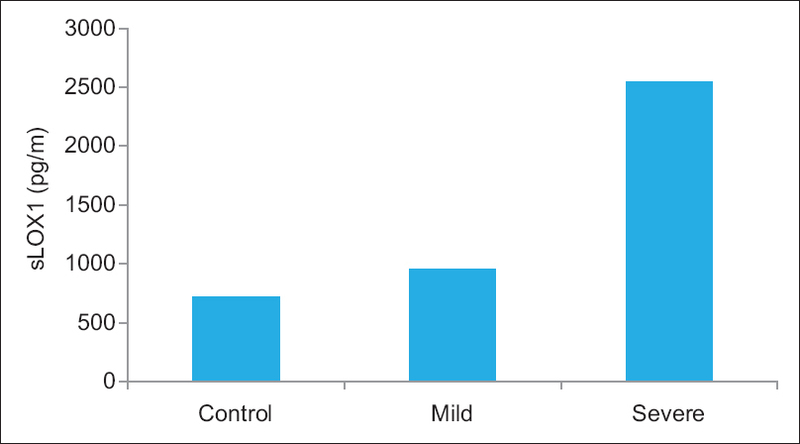 Serum sLOX-1 concentrations were measured with an enzyme-linked immunosorbent assay (Kino Biotech Co., Ltd., China). Post hoc test and one-way ANOVA were used for comparison between different groups' means. Nonparametric analysis was used on limited sample sizes or nonnormally distributed variables; PE patient was categorized into three groups according to their dissimilarities. Finally, the sensitivity, specificity, cutoff value was explored with receiver operating characteristic curve analysis. All tests were two-sided, and results are presented as means ± standard deviation, relative risks were determined by used odds ratios with 95% confidence intervals. Univariate analysis was performed and the variables with P < 0.01 were entered into a backward stepwise multivariate logistic regression model to assess the independent predictors of PE. P < 0.05 was considered statistically significant. The statistical calculations were performed using Statistical Package for the Social Sciences version 17 (SPSS, IBM Company, Chicago, USA). The study groups were classified into either a preeclamptic group (n = 56) or a healthy pregnant group (n = 28) according to the presence of well-defined PE criteria. Baseline demographic, clinic, and laboratory characteristics of the study groups were presented in [Table 1]. There was no difference between the two groups in terms of age, BMI. sLOX-1 was 1749.86 ± 1052.76 versus 720.92 ± 86.17 (pg/ml), were found to be significantly increased in the PE group as compared to the healthy pregnant, [Table 1]. Baseline demographic, clinic, and laboratory characteristics of the mild and severe PE groups were summarized in [Table 2]. Systolic and diastolic blood pressures were found to be raised as the severity of the disease increased. Furthermore, sLOX-1 (2545.9 ± 969.36 vs. 953.82 ± 61) were significantly elevated in the severe PE group as compared to the mild preeclamptic pregnant [Figure 1]. A significant positive correlation was found between serum sLOX-1 levels and systolic BP (P = 0.001). In addition, systolic BP was significantly correlated with BMI, gestational age (P < 0.05). [Table 3] in multivariate regression model including BMI, age, gestational age, sLOX-1 showed that sLOX-1 and BMI were the only significant predictors of systolic blood pressure, [Table 4]. Simple logistic regression analysis showed that age, gestational age, uric acid, and sLOX-1 levels showed a trend (P < 0.10) toward an association with the presence of low birth weight [Table 5]. All these variables were then entered into a backward stepwise multivariate logistic regression model. Multivariate logistic regression of revealed that BMI, gestational age and sLOX-1 levels remained as a significant and independent predictor of low birth weight [Table 6]. The main findings of the present study were as follows: Elevated sLOX-1 was related to PE; A significant association of sLOX-1 with the presence of low birth weight and sLOX-1 significant and independent predictor of low birth weight. PE affects and complicates approximately 2%–10% of pregnancies. The main pathophysiologic mechanisms of PE, which are not fully elucidated and similar to cardiovascular diseases such as atherosclerosis and coronary and peripheral arterial diseases, are severe inflammation, increased cytokines and pro-inflammatory molecules release, endothelial dysfunction and dysregulation, angiogenesis, inappropriate placentation, oxidative stress, and immunological and genetic factors. Variable clinical presentation, limitations of available blood pressure level and proteinuria measurement methods, and early and fast progression of disease before precise diagnosis are unique and major issues of PE%.,, Therefore, novel, easy measured, and cheap markers are needed to increase early diagnosis and treatment for PE. In this study, the level of sLOX-1 significantly associated with low birth weight and severity of PE [Table 3] and [Table 5]. LOX-1 in the maternal systemic circulation of PE remains unknown was investigated. One of the earliest and most critical events in the development of endothelial dysfunction is the interaction of ox-LDL and the LOX-1 receptor. LOX-1 expression had found to be induced under other pathological conditions. This induction appears to be mediated by Ox-LDL which upregulates LOX-1 expression in a time- and concentration-dependent manner., Nevertheless, English et al. reported that inhibition of LOX-1 can prevent endothelial dysfunction in an in vitro model of PE and may prove useful as a therapeutic target in the treatment. In the present study, maternal serum sLOX-1was measured in PE and normal pregnant women, and it was found highly elevated in PE groups in comparison with control group. sLOX-1 was also found to be significantly higher in severe PE group as compared to mild PE and controls. Like many cell surface receptors with a single transmembrane domain, LOX-1 can be cleaved at the membrane proximal extracellular domain by serine proteases and released in a soluble form. However, the current study measured serum sLOX-1 levels in PE patients only at late pregnancy. The principal findings were that severe PE patients had associated with increased sLOX-1 level; the high circulating sLOX-1 concentrations suggested an underlying role of sLOX-1 in PE occurrence and progression. This is may be explained in part by function of LOX-1 in cell proliferation, apoptosis, and cell migration, the increased level of serum sLOX-1 in PE patients may be explained by the ischemic changes seen in the placenta which in turn release not only factors which involved in vascular tone atherogenesis such as placenta-related protein, soluble fms-like tyrosine kinase-1, and others but also innate immunity mediators such as Damage Associated Molecular Patterns receptor proteins which act by binding carbohydrate thereby recognizing dead and/or apoptotic cells. On the other hand, sLOX-1 with its lectin-like structure could be also involved in phagocytosis of aged cells, and apoptosis occurring in placenta in this disease, consequently there will be increasing demand for this protein both in placental tissue and the circulation leading to upregulation of its expression and subsequent cleavage and release into the circulation aiding the clearance of apoptotic cells. However, further researches are needed to elucidate the exact role of this protein in PE. We demonstrated, elevated level of sLOX-1 with the presence and the severity of PE and it was independent predictor of low birth weight in PE women together with gestational age and BMI after removal of other factors and the results highlight the involvement of innate immunity molecules and inflammation in pathogenesis of PE through binding to apoptotic cells and angiogenic process, also multivariate logistic regression analysis revealed that serum sLOX-1 level was independently associated with the low birth weight. Gupta A, Gaur BS, Mishra KB, Dubey I. A comparison of platelet count in severe preeclampsia, mild preeclampsia and normal pregnancy. Int J Res Med Sci 2018;6:671-6. Tomimatsu T, Mimura K, Endo M, Kumasawa K, Kimura T. Pathophysiology of preeclampsia: An angiogenic imbalance and long-lasting systemic vascular dysfunction. Hypertens Res 2017;40:305-10. Amaral LM, Wallace K, Owens M, LaMarca B. Pathophysiology and current clinical management of preeclampsia. Curr Hypertens Rep 2017;19:61. Cakmak HA, Dincgez Cakmak B, Abide Yayla C, Inci Coskun E, Erturk M, Keles I, et al. Assessment of relationships between novel inflammatory markers and presence and severity of preeclampsia: Epicardial fat thickness, pentraxin-3, and neutrophil-to-lymphocyte ratio. Hypertens Pregnancy 2017;36:233-9. Li C, Zhang J, Wu H, Li L, Yang C, Song S, et al. Lectin-like oxidized low-density lipoprotein receptor-1 facilitates metastasis of gastric cancer through driving epithelial-mesenchymal transition and PI3K/Akt/GSK3β activation. Sci Rep 2017;7:45275. Fujita K, Kondoh E, Chigusa Y, Mogami H, Kawasaki K, Ujita M, et al. A Pilot Study Investigating the LOX Index as a Potential Biomarker of Endothelial Function in Pregnancy. Hypertension Res Pregnancy 2017;5;1-5. Yan M, Mehta JL, Zhang W, Hu C. LOX-1, oxidative stress and inflammation: A novel mechanism for diabetic cardiovascular complications. Cardiovasc Drugs Ther 2011;25:451-9. Murase T, Kume N, Kataoka H, Minami M, Sawamura T, Masaki T, et al. Identification of soluble forms of lectin-like oxidized LDL receptor-1. Arterioscler Thromb Vasc Biol 2000;20:715-20. English FA, McCarthy FP, McSweeney CL, Quon AL, Morton JS, Sawamura T, et al. Inhibition of lectin-like oxidized low-density lipoprotein-1 receptor protects against plasma-mediated vascular dysfunction associated with pre-eclampsia. Am J Hypertens 2013;26:279-86. Chen M, Masaki T, Sawamura T. LOX-1, the receptor for oxidized low-density lipoprotein identified from endothelial cells: Implications in endothelial dysfunction and atherosclerosis. Pharmacol Ther 2002;95:89-100. Mollace V, Gliozzi M, Musolino V, Carresi C, Muscoli S, Mollace R, et al. Oxidized LDL attenuates protective autophagy and induces apoptotic cell death of endothelial cells: Role of oxidative stress and LOX-1 receptor expression. Int J Cardiol 2015;184:152-8. Hoy WE, Nicol J. The Barker hypothesis confirmed: Association of low birth weight with all-cause natural deaths in young adult life in a remote Australian Aboriginal community. J Develop Origins Health Dis 2018; 25:1-8. Huang H, Coleman S, Bridge JA, Yonkers K, Katon W. A meta-analysis of the relationship between antidepressant use in pregnancy and the risk of preterm birth and low birth weight. Gen Hosp Psychiatry 2014;36:13-8. Sohlberg S, Mulic-Lutvica A, Lindgren P, Ortiz-Nieto F, Wikström AK, Wikström J, et al. Placental perfusion in normal pregnancy and early and late preeclampsia: A magnetic resonance imaging study. Placenta 2014;35:202-6. Roberts JM, Druzin M, August PA, Gaiser RR, Bakris G, Granger JP, et al. ACOG Guidelines: Hypertension in Pregnancy. American College of Obstetricians and Gynecologists, Washington, DC; 2013. Duhig K, Vandermolen B, Shennan A. Recent advances in the diagnosis and management of pre-eclampsia. F1000Res 2018;7:242. Gathiram P, Moodley J. Pre-eclampsia: Its pathogenesis and pathophysiolgy. Cardiovasc J Afr 2016;27:71-8. Tuten A, Erman H, Korkmaz GG, Oncul M, Gelisgen R, Sozer V, et al. 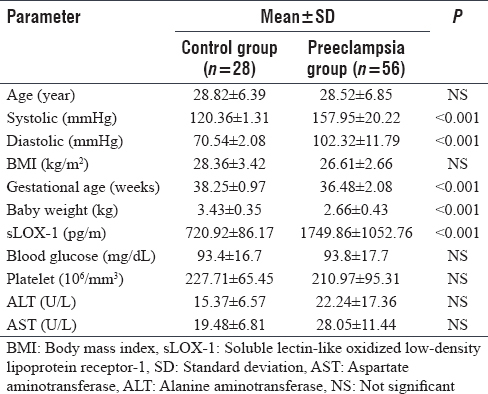 Comparison of maternal and umbilical cord blood soluble lectin-like oxidized low-density lipoprotein receptor 1 levels in early- and late-onset preeclampsia. Arch Gynecol Obstet 2014;290:1007-13. Zuniga FA, Ormazabal V, Gutierrez N, Aguilera V, Radojkovic C, Veas C, et al. Role of lectin-like oxidized low density lipoprotein-1 in fetoplacental vascular dysfunction in preeclampsia. Biomed Res Int 2014;2014:353616. Huppertz B, Kingdom J, Caniggia I, Desoye G, Black S, Korr H, et al. Hypoxia favours necrotic versus apoptotic shedding of placental syncytiotrophoblast into the maternal circulation. Placenta 2003;24:181-90.